CARSTAR Collision Specialists in Wichita, KS was voted the First-Place Winner for “Best Auto Body Repair Shop” in the Transportation category in a Reader’s Choice Competition by the Wichita Eagle newspaper. 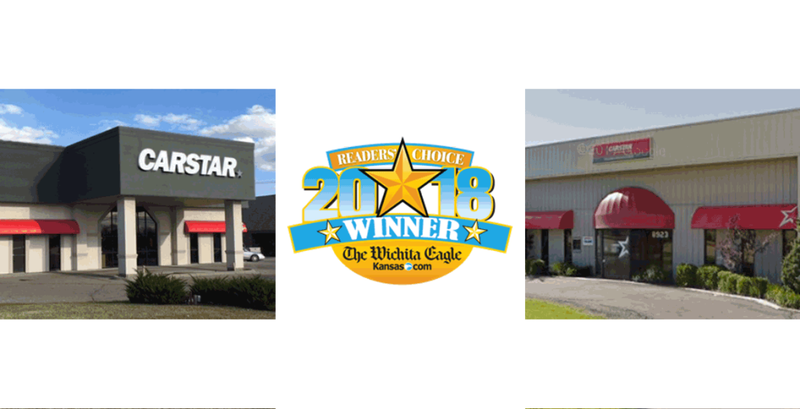 This is the third year in a row CARSTAR was chosen by the Wichita Eagle. The 2018 Reader’s Choice Competition is sponsored by the local newspaper. Each year the publisher collects votes on the “best” businesses and services in Wichita. The 175 categories range from transportation, food, entertainment, health, to service providers. This was the 8th year of the competition. The Reader’s Choice competition is a pure, audited, popular vote. It is Wichita’s largest and most established contest. Online voting was done July 20-August 13th. Over 87,000 Wichita Eagle readers cast their votes. A special online directory announced the winners on September 21st. A newsprint tabloid on September 28th will publish lists of all the winners and favorites chosen. CARSTAR was chosen the “First Place Winner” for receiving the most votes. CARSTAR Collision Specialists have two locations in Wichita. CARSTAR Collision Specialists East is located at 606 N Webb Road and CARSTAR Collision Specialists West is located at 8923 W Kellogg. For more information on these two locations, please visit www.kscarstar.com. CARSTAR Collision Specialists also received the prestigious Integrity Award Winner in 2013 from the Better Business Bureau.